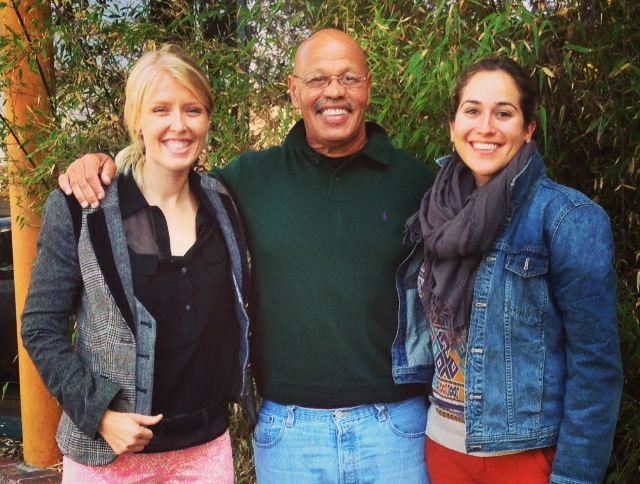 Coach, center, with the Root & Rebound team (Sonja, left, Katherine, right) on a beautiful Berkeley fall day. Last week, we had the honor and pleasure of sitting down with one of our inspirations and mentors, Alton McSween, better known in the community as “Coach.” Coach got out of prison on April 4, 2013 after California passed a reform to our draconian Three Strikes Law in November of 2012, and Coach was able to petition under this reformed law, Prop 36, for release. In 1994, California voters enacted the “Three Strikes and You’re Out” law. The law imposed a life sentence for almost any crime, no matter how minor, if the defendant had two prior convictions for crimes defined as serious or violent in the California Penal Code. According to official ballot materials promoting the original Three Strikes law, the sentencing scheme was intended to “keep murderers, rapists, and child molesters behind bars, where they belong.” Instead, more than half of people sentenced under the law were serving sentences behind bars for nonviolent crimes. In 2012, California voters overwhelmingly enacted the Three Strikes Reform Act (“Proposition 36”) to address the harshest, and unintended, consequences of the sentencing law. First, Prop. 36 eliminated life sentences for non-serious, non-violent crimes. Second, it established a procedure for prisoners sentenced to life in prison for minor third-strike crimes to petition in court for a reduced sentence. In order to win a reduced sentence, a court must find that the prisoner no longer poses an unreasonable threat to public safety. Coach’s first “two strikes” were residential burglaries in 1992 and his “third strike” for petty theft in 2001, a non-violent, non-serious felony. He was sentenced to 25 years to life in prison, with his earliest possible release date as April 26, 2026. Yet Coach did not give up on improving himself or his life circumstances. From inside prison at San Quentin, Coach was a model citizen. He was a friend, advocate, and role model for many, and was he was involved in more self-improvement work than most of us are in a lifetime. Coach took advantage of all of the programs he could and was involved in a number of wonderful groups, including: Project IMPACT (Incarcerated Men Putting Away Childish Things; The Addiction Recovery Counseling (ARC) Program; The GRIP Program (Guiding Rage Into Power, a violence prevention and emotional intelligence life-skills program); and he began his training as an addiction recovery counselor through California Association of Alcoholism & Drug Abuse. It was clear from talking to Coach that he took advantage of all of the resources available to him at San Quentin so that he could build a better future for himself and a better world for his community, both inside and out of prison. And that is exactly what he has done. Now out of prison, Coach has continued his incredible work in the Bay Area community through his job with the California Reentry Institute, an organization that he became involved with at San Quentin. CRI staff provides its incarcerated members (about 34 men currently) at San Quentin with counseling, resources to assist them with their parole hearings, and prepares the men for release. CRI also provides many forms of reentry support to its members coming out of prison, and this is where Coach does his current work in the community. Coach is now a CRI program coordinator, a reentry mentor, and transitional housing supervisor. Coach wants to help guys coming out of prison to navigate the world, because he knows from first hand experience how scary and daunting that can be. When the CRI men first come out, Coach picks them up at the bus or train station and is the first friendly face that many of them see. He brings the person a backpack filled with a new and clean change of clothing, toiletries, a prepaid cell phone for the month, and other essentials—a “survival kit.” Coach then accompanies the person to his housing arrangements and takes them shopping for food. Coach talked to us about the incredible moment he has with all the men he works with who get to a grocery store for the first time in years, and how excited they are to see all of the options. In addition to his work with men reentering the community through CRI, Coach is close to completing his counseling certificates in Domestic Violence and Addiction Recovery, so that he can one day work as a counselor in these areas. Coach’s life passion for reentry work and helping others is clear from the moment you meet him. He is involved in so many different groups because he is hopeful that life can and will get better for the people in prison and jail and those coming out. Coach believes in creating family wherever he goes, and treats strangers and friends alike with dignity and kindness. We are unbelievably lucky to call him an inspiration and mentor. We know he will continue doing incredible things. Coach, thank you for your wisdom and for sharing your story! For more information about the Three Strikes Law and its reform, please visit the website for the Three Strikes Project at Stanford University, the group that made this reform (Prop. 36) possible: http://www.law.stanford.edu/organizations/programs-and-centers/stanford-three-strikes-project. Exciting news today that Target, one of the United States’ largest corporations and employers, has “banned the box” from its employment applications, meaning that it will not ask people about their criminal records in their initial job application. Target nevertheless reserved the right to ask about criminal backgrounds after the completion of an applicant’s first interview. The change at Target comes on the heels of other big changes around the country and the state of California. Earlier this month in California, Gov. Jerry Brown signed a ban-the-box bill that applies to government employers. Ten states and more than 50 U.S. cities have passed “Ban the Box” legislation, according to the National Employment Law Project. In 2012 the federal Equal Employment Opportunity Commission expanded and updated a ruling that barred employers from automatically denying people jobs based on arrest or conviction records. The E.E.O.C. guidance made clear that an arrest alone is not proof of illegal conduct or grounds for exclusion from employment. It also explained that employers need to take into account three factors: (1) the seriousness of the offense, (2) the time that has passed since it was committed and (3) the relevance of the crime to the job being sought. We hope that that this is just the beginning of a sea change in employment practices, and that other large corporations follow Target’s footsteps, making the choice to “ban the box” because it is the RIGHT thing to do. For now, it’s a small victory for the 65 million people in the U.S. with criminal records, their families, communities, and a sign of our country moving in the right direction. 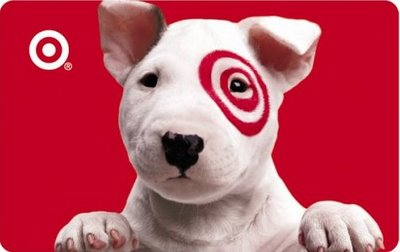 And it’s a good reason to feel better about doing some Target holiday shopping! To read more about today’s news, check out the NY Times op-ed and the Huffington Post’s coverage. 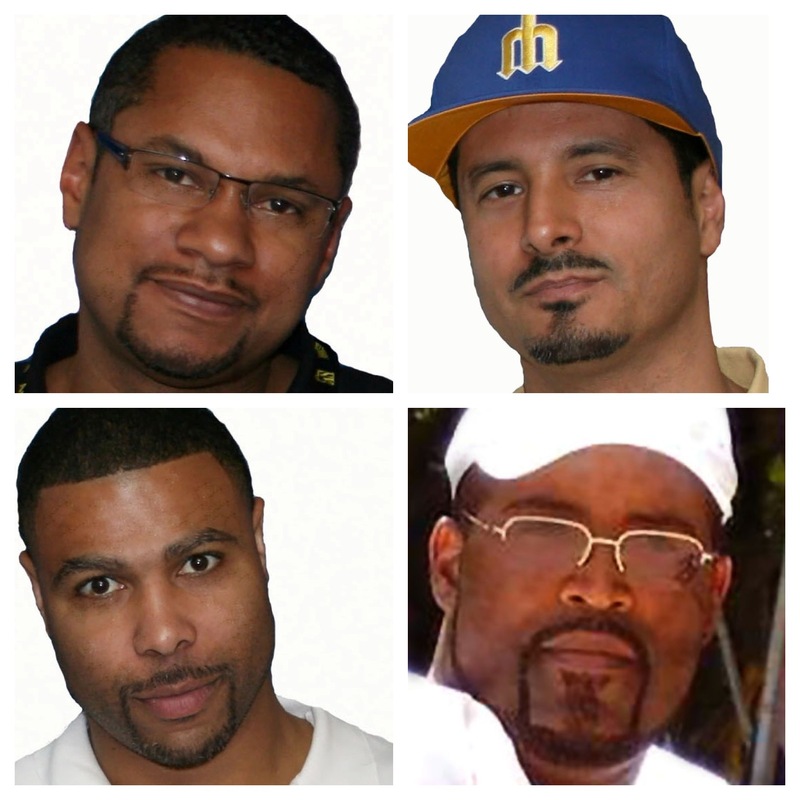 Project Rebound leadership (clockwise from top left): Director Jason Bell, Data Specialist Airto Morales, Staff Member Joseph Miles, Staff Member Eric Durnell. This week, the Root & Rebound team had the pleasure of meeting with leaders of Project Rebound, a nonprofit group that works out of San Francisco State University (SFSU). We met with Project Rebound’s Director Jason Bell, Data Specialist Airto Morales, Staff Member Joseph Miles, and Social Work Intern Deborah Boldwin, with whom we spoke about legal and social services gaps in reentry. We wanted to share with you a bit about Project Rebound’s mission and program operations to highlight the critical work they do in the Bay Area community. Project Rebound’s mission is to support the formerly incarcerated on their journey through successful reintegration in a college setting. In 1967, Professor John Irwin created Project Rebound as a way to matriculate people into SFSU directly from the prison and jail systems. The focus of Project Rebound quickly became “Education as an Alternative to Incarceration” and “Turning Former Prisoners to Scholars.” Since the program’s inception, it has assisted and supported hundreds of formerly incarcerated people to obtain four-year degrees; some have gone on to get Master’s degrees, PhDs, and JDs. Project Rebound’s reach extends beyond the SFSU campus, as staff make an effort to mentor and assist prisoners who write to them from across the state and country. Project Rebound responds to every person who writes to them from prison and jail, or from the outside. Even if people who initiate contact are not college-ready, Project Rebound staff will send them a detailed education plan; each prospective students learns how and where they can become college-ready and how to prepare for enrollment at SFSU. If, for example, someone writes from prison wishing to improve his or her education, but doesn’t have a college degree, Project Rebound will tell them to start with the GED program at his or her prison and explain how to apply. If someone writes who is college-ready but currently incarcerated, Project Rebound will connect him or her with community colleges that run correspondence programs he or she can join. Once they are out, formerly incarcerated people in the Bay Area connect with Project Rebound to learn more about opportunities in higher education. Director Jason Bell says, “If people can make it to our office, no matter where they come from, we will do everything in our power to help them.” Project Rebound assists people in reentry with the smallest and biggest of needs: the organization helps pay for people to take the SAT and ACT, find safe housing, and acts as a home base for formerly incarcerated men and women in the greater Bay Area. One of the many things that makes Project Rebound stand out is its mentorship model. Its mission is that, “From prison to empowerment, from destitution to the notion of ‘restorative justice,’ we are here to aid those who want to help themselves and to help others. We are still about the business of ‘each–one—teach–one.’” Individuals who come to the Project Rebound office at SFSU are met by a staff who have been through similar circumstances—all of the Project Rebound leadership is formerly incarcerated, people who believe in reaching their hand back to help those who have stumbled down negative paths much like they did years ago. Therefore, part of being involved in Project Rebound is believing in and living this mentorship model. Current Project Rebound students and alumni are given a stipend for serving as mentors—simultaneously providing a knowledgeable mentor to newly-released students and supporting people with criminal records who need a source of income. Project Rebound is an exceptional model, run by an exceptional group of people. It provides triumphant direction to so many people coming out of prison and jail, ready to restart their lives. Our hope is that Project Rebound will grow and that its model will be implemented at other universities across California and the country. We are in dire need of more programs like this one. Thank you, Project Rebound, for the wonderful work you are doing in our community, and for sharing so many great ideas with us. We have great hopes for many future collaborations! P.S. To learn more about Project Rebound, please visit their website and facebook page, email projectrebound@asi.sfsu.edu, or call the program at (415) 405-0954. This past week has been full of inspiration at Root & Rebound. Michelle Alexander, author of The New Jim Crow: Mass Incarceration in the Age of Colorblindness, came to San Francisco to speak about her research and describe the movement she imagines for achieving racial justice and ending mass incarceration in America. 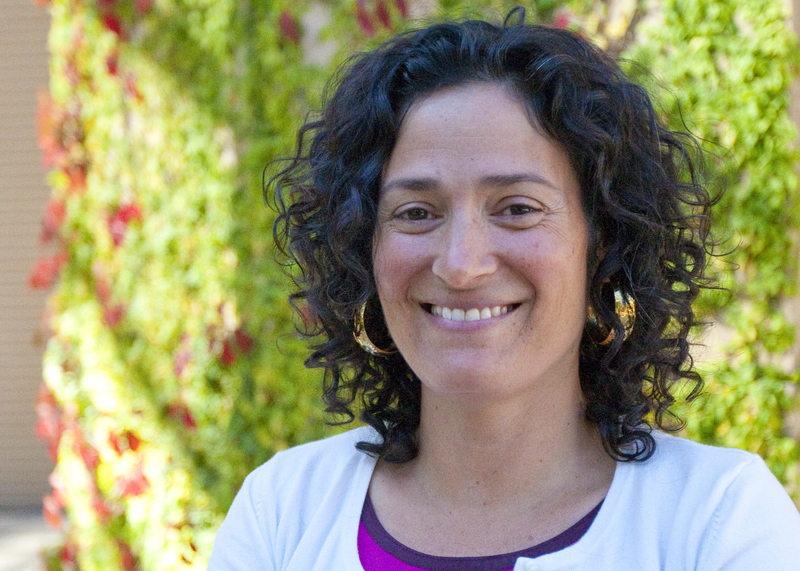 Her lecture raised money for the California Institute of Integral Studies’ (CIIS) brand new Arc of Justice scholarships, ten scholarships that will be awarded to formerly incarcerated men and women to complete their Bachelor of Arts degrees at CIIS. As an audience member and staff person at R & R, one of the most poignant pieces to Prof. Alexander’s lecture was how she broke down into layperson’s terms what she calls “legalized discrimination” against people exiting prison & jail and reentering society. What she means is that, while we no longer have laws on the books that are racist on their face, we have a legal system that disproportionately locks up people of color, and laws that, even after people have served time in prison and jail, exclude them from participating in society. Watch more by clicking the link below. In the second video clip, Prof. Alexander returns to big picture concerns—how to build a movement to end our current system of mass incarceration based largely upon race, the reality of prison expansion and its economic impact, and what we must do to change these systems going forward. She also discusses the importance of California’s prison system as a model for the rest of the country. We hope to be a part of the solution—that our small nonprofit will be part of a larger movement in California and around the country to respond with compassion, care, and empathy to those who have been locked up and locked out of society. If you want to read more about these issues, we recommend picking up a copy of The New Jim Crow—a must-read for everyone living in the United States or anyone abroad who wants to understand the crisis of prisons, racial segregation, and criminal justice in America. 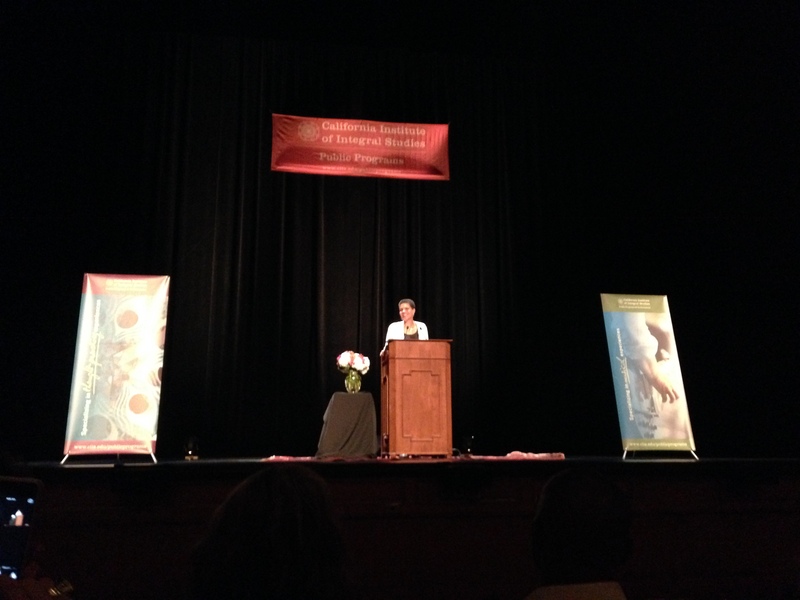 To learn more about Michelle Alexander’s professional background and the funding for her book The New Jim Crow, please visit the California Institute of Integral Studies’ event website by clicking here. Some people have asked us about our name… What does it mean? Where does it come from? It’s a simple concept, really, that we felt perfectly described the process, at any stage of life, of trying to restart and reset, and how difficult and thrilling and terrifying that process is for all of us. “Reentry” after serving a prison or jail term is exactly that: the human process of starting over, but after years, sometimes many decades, isolated and removed from a world that has changed without you in it. In Yoga, there is the concept of “Root and Rebound,” or “Rooting to Rebound.” The idea is that, in order for us to grow fully, and be the greatest version of ourselves (physically, mentally, and emotionally), we must first be grounded and firmly rooted into this beautiful Earth. Our hope is that, as an organization, we are able to help people find their “groundedness” in the world, to reconnect with or reestablish roots, so that they can more quickly become the fullest and best version of themselves. We hope to be a place where people always feel at home, whether it is to come in for a legal meeting, a group workshop, or just to sit in a community space, drink some tea, and read the paper. So that’s the story… but we also leave “R & R” up to your own personal interpretation! Today is our one week anniversary over at Root & Rebound. 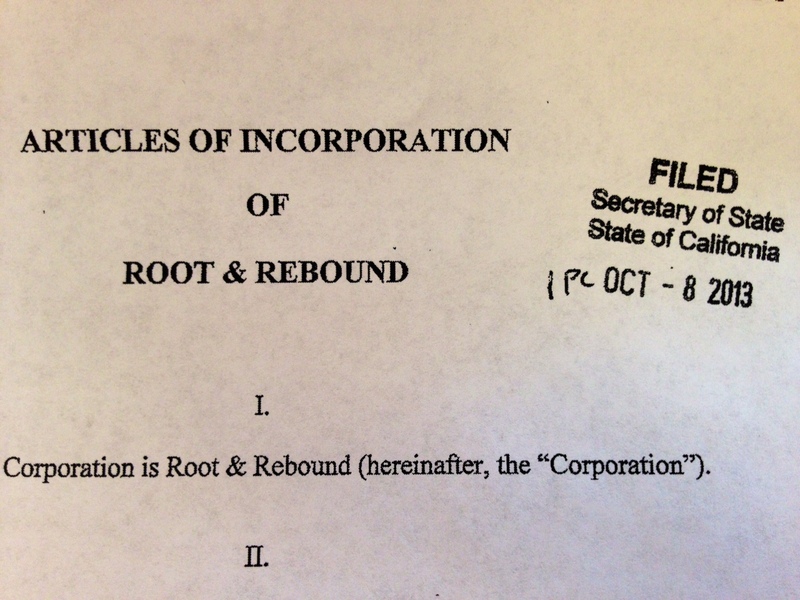 It has been a very exciting week, and we are happily incorporated as a nonprofit corp. in the state of California! (Proof below). Also had some wonderful and inspiring meetings this week, which we hope to share with you all very soon.